Katy Badeaux, a reference and research librarian at the John M. O'Quinn Law Library, provides guidance on research tools during a workshop at the University of Houston Law Center. June 16, 2017 - Research specialists at the John M. O'Quinn Law Library shared their knowledge during a recent continuing legal education session at the University of Houston Law Center. 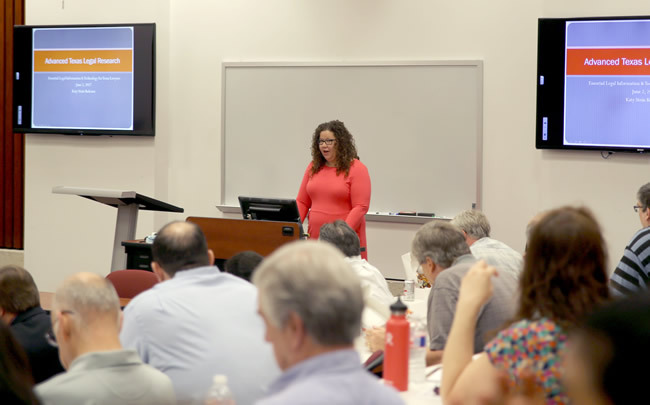 "Essential Legal Information & Technology for Texas Lawyers," was a free training workshop in advanced Texas legal research that provided attendees with information on free and low cost legal resources, and the latest legal technology. Participants received three hours of CLE credit. Reference and research librarian Katy Badeaux opened the discussion with a session that concentrated on Texas statutory research, bill tracking, legislative history and administrative agency research. Badeaux teaches frequently on legal research topics for students and practitioners and writes about research issues specific to Texas and its legislature. The second speaker was Chris Dykes, interim associate director for research, who discussed free and low-cost online resources for lawyers. Dykes is an adjunct professor at the Law Center and teaches Tax Research. Dykes frequently conducts training sessions on legal research for law students and law librarians. The final speaker, was Emily Lawson, interim associate director for library administration. Lawson's session provided information about how to research legal technology options and how to stay up to date on technology trends. She gave examples of technology of interest to lawyers, such as legal apps and software.